Amazing Grace Q9 Microphone is a wireless bluetooth karaoke microphone, can be compatible with most of the android phone and IOS phone, and when you connect your android phone, pls choose the button "android" on the surface of our mic, portable and handheld, with a rechargerable batteries, which need to be charger about 2-4 hours when you receive it at the first place. And there is four effect on the surface, normally, we advice to turn on all of them inable to make a loud and clear voice. Meanwhile, there is a voice control on the surface, it is only for adjusting the microphone voice. If you want to make the music more loud, then you can adjust the voice of your cellphone. Bluetooth use 1:Compatible with all bluetooth device, easy to connect and use. 2:Four effects, can choose the effect you want. 3:Have the next, pause/play and the previous button for your music 4:A USB cable for charger, a Micro USB to Audio Cable for recording. 5:Come with a nice sturdy case, portable to take everywhere. 【KTV ECHO EFFECT】 - the highest quality chipset with two channel stereo Microphones,more stunning KTV live-sound,more clear music rhythm with echo reverberation. 【SAFE BATTERY】 Normal use of life time of 11-14 hours (In the normal charge 3-4 hours after full power). High-quality dual speakers to bring the perfect sound. Aluminum-magnesium alloy body to enhance hand feeling. 【EASY TO OPERATE】 - Multi-function buttons can set the treble, bass, reverb, accompaniment, playback volume. Free to modify the previous and next song. 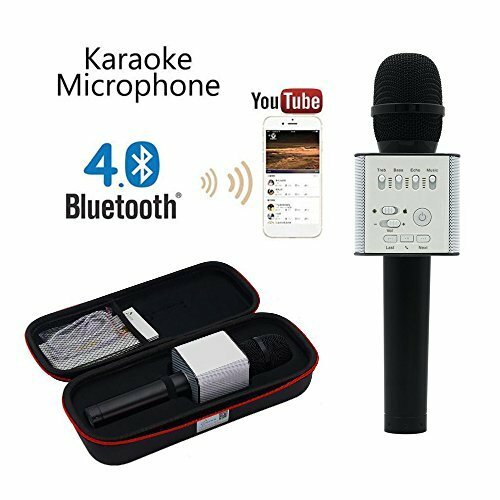 【MULTIPURPOSE】 - the Best Wireless Karaoke with bluetooth speaker, KTV singing, Gathering singing, Family singing, Travel singing, Car Stereo, Instrument Recording, Interviews and Live etc. If you have any questions about this product by MICGEEK, contact us by completing and submitting the form below. If you are looking for a specif part number, please include it with your message.